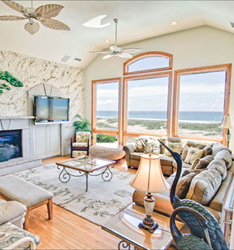 The 2016 rental season is shaping up to be a good one on the Outer Banks, according to the folks at Sun Realty of Nags Head. Not only did 2015 close out a big success for the family-owned company, but a record number of advanced reservations put the 2016 year off to a strong start. Sun Realty opened its first office on May 15, 1980. Six more locations later, the company attributes much of its success to hiring, training, and supporting a top-notch staff. Sun Realty is made up of over 130 year-round employees, inflating to over 400 seasonally, who bring a variety of life experiences to their roles. Beyond its staff, Sun is pleased to represent some fantastic homeowners, many whom started out as vacationers who fell in love with the Outer Banks. Families from all walks of life have realized the dream of vacation homeownership on the Outer Banks, and enjoy sharing their homes with others. As the 2016 summer season kicks into gear, and Sun Realty celebrates its 36th anniversary, the company’s staff is fully prepared and excited to welcome first-time and long-time OBX vacationers. Here’s to a great season and continued success for the real estate sales and vacation rental company; representing the best of the Outer Banks since 1980. Sun Realty is a real estate sales and vacation rental company on the Outer Banks of North Carolina. Established in 1980 by founder and CEO Paul Breaux, Sun covers the entire Outer Banks with 7 offices: Harbinger, Corolla, Duck, Kitty Hawk, Kill Devil Hills, Salvo and Avon. Sun Realty represents the largest selection of vacation rentals on the Outer Banks and has a sales team in every office. Visit http://www.SunRealtyOBX.com and http://www.SunRealtyNC.com for more information.